Stems: Erect, ascending or decumbent, stout, simple or much-branched, glabrous or sometimes minutely glandular-hairy in inflorescence. Leaves: Opposite, simple, mostly sessile and clasping, broadly lanceolate to ovate, 1 to 3 inches long, .25 to 1.5 inch wide, glabrous, fleshy; margins toothed or entire; tips pointed. 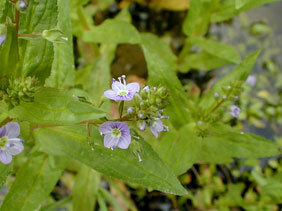 Inflorescences: Racemes, 2 to 5 inches long, 30-60-flowered, in leaf axils; bracts reduced, lanceolate to linear. Flowers: Weakly 2-lipped; stalks about 1/4 inch long, ascending or upcurved; calyces deeply 4-parted, segments broadly lanceolate; corollas 1/5 to 2/5 inch wide, irregularly 4-lobed, blue or pale violet with darker purplish lines; stamens 2, each with 2 equal, somewhat parallel anther cells. Fruits: Capsules, 2-lobed, slightly longer than wide; seeds tiny, numerous. Habitat: Stream banks, wet meadows, and in water of springs and slow-flowing streams. Comments: Naturalized aquatic plant found throughout most of the U.S.